How Do Compostable Liners Work? 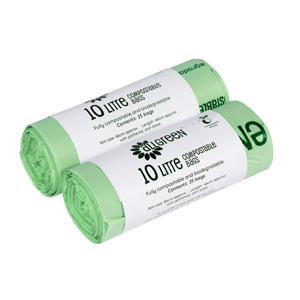 Compostable liners contain starch and other natural/biodegradable materials. They are highly breathable, which helps reduce the amount of moisture in your food waste – Drying out the food waste in this way drastically reduces odour. This means you may find moisture in the bottom of your compost caddy when you remove the bag – It doesn’t mean the bag is leaking – it’s just doing its job! The composting process is triggered by heat, moisture and sunlight. When this happens, the bag will begin to breakdown harmlessly along with the contents. It is vital that you store your compostable bags in a cool, dark, and dry place – Otherwise they begin to break down! A kitchen cupboard or drawer is ideal and under these conditions you would expect our liners to have a life of approximately 18 months. Remember To Use the Oldest Liners First! It’s easy when you purchase more liners to put the new ones at the front of the drawer and push the old ones to the back! Of course, then the older batch of liners will not be used for a long time, so it’s likely they will soon be over 18 months old and begin to break down. When liners begin to break down, they may split as you take them off the roll, form holes, or even create strange zig-zag tear patterns. This is completely normal if you try to use old bags. The GOLDEN RULE is to not buy more than you need and always use the oldest ones first!